After each game, the St Domingo’s team will provide a brief review of the match with performance ratings for each player. Each month these ratings will be used to decide the St Domingo’s player of the month and at the end of the season, player and young player of the year. Please let us have your comments and feedback. The early rounds of the League Cup always present an interesting dilemma for managers, on one hand they are eager to progress, on the other they are presented with an opportunity to give the squad members who have so far missed out on selection an early chance to impress and push for inclusion in Premier League fixtures. Martinez decided to rotate, making eight changes from the side that played in the first two games of the season, with only Jagielka, Osman and Barkley retaining their place. We started well, with a noticeable increase in the tempo, however as with the West Brom fixture opportunities came and went, with no one showing any composure in front of goal. 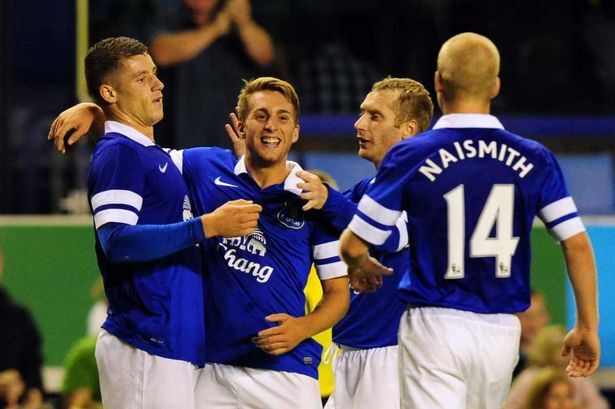 Osman and Kone were both guilty of glaring misses after good work from Barkley and Deulofeu. The two teenagers were impressing, as was young John Stones at the back, the three head and shoulders above everyone else on the pitch. Unbelievably Everton fell behind around the half-hour mark. The Everton defence were caught sleeping by a long ball over the top and the pull back was fired into the back of the Street End net. The Blues did respond quickly, Deulofeu capping a fine debut with a well taken goal. The second forty-five was dominated by Everton, but more poor finishing let Stevenage off the hook. Indeed, it took a fine save in injury time from Joel to keep the score level. Injury time saw Fellaini introduced for the tiring Barkley and it was the giant Belgium who made the difference. Pushed further forward, Fellaini was a constant headache, and after two near misses, he fired home after the ball ricocheted round the box.